1. Write an application for verification on simple paper and also mention roll no, class , session in application (also attach self attested photo copies of your documents with application. 2. Send a Demand Draft of Rs. 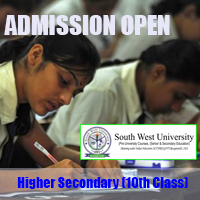 1500/- ( non-refundable ) for each documents drawn in favour of : " south West Univercity MH " payable at New Delhi . 3. Add Rs. 100/- postal charges Extra in India and Rs. 1000/- for out side of India. 4. Verification charges for Central / State Govt. departments and Embassies are same. 5. Normal period required for verification 15-45 days. 6. Please, mention your postal adress and Phone No. on the application. NOTE: VERIFICATION BY TELEPHONE / FAX / E.MAIL WILL NOT BE ENTERTAINED. Any one can apply for any type of letter like Status of Board /Approvel etc. from the Board. 1. Write an application for apply (any type of letter) on simple paper, and also mention roll no, class , session in application (also attach self attested photo copies of your documents with application. 2. Send a Demand Draft of Rs. 1500/- ( non-refundable ) for each letter drawn in favour of : " BOARD " payable at New Delhi . 4. charges for Central / State Govt. departments and Embassies are same. 5. Normal period required for query / letter is 15-30 days.